Barbara Martin graduated from Denison University with a music major, and settled in New York City in the early 1950’s to study voice. After a short career as a folk singer in small clubs in Greenwich Village, where by her own admission, “I got bored with my own singing, just totally bored with it”, Barbara enrolled in a piano tuning school in Manhattan. Barbara tuned pianos all over Manhattan, Queens and the Bronx, but still thought of the work as a hobby. After moving to Indianapolis in 1955 she decided to make it her business. Following a 2 year internship with the Jordan School of Music at Butler University, Barbara Martin Piano opened for business. A piano can be many things to its owner: an expensive investment, a cherished family heirloom, or an instrument for the next Van Cliburn or Jerry Lee Lewis. Whatever the case may be, the one constant is that the piano is a complicated and delicate instrument, that requires an experienced and competent touch. Barbara Martin Piano has been providing those qualities since 1955. Barbara Martin's daughter Debbie and her talented staff of technicians continue to carry on this tradition by setting high standards of craftsmanship and service in the piano industry. The past considered as a whole: Barbara Martin Piano has a 50 year history of excellence in the piano service industry. Adjust (a musical instrument) to the correct or uniform pitch: it is important to have a professional tune your piano. 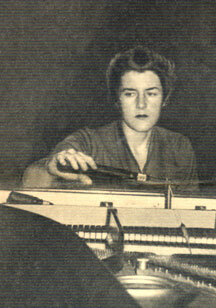 One of the first women to tune piano's professionally. Barbara appeared on the game show "What's My Line" in 1960 and stumped the panel with her profession.